It’s quite common these days to have a basic protection such as an anti-virus installed on our PC or even a Smartphone as the first layer of defense. Some of us might even have a firewall installed. Few other may have another layer of defense installed in the form of anti-malware, commonly known as second layer of defense. While traditional first layer of defense, aka anti-virus, are not that good enough to protect us 24x7- as the virus definitions need to be update before it can catch the infection. So it’s a bit slow on defense. Firewalls on the other hand are very static in nature and can just manage the network traffic in-and-out of your system. So again not so effective. So now comes the role of second layer of defense, aka anti-malware. herdProtect is a second line of defense malware, an Anti-Malware Scanner, powered by 68 anti-malware engines in the cloud. Its a 'herd' of multiple engines that guarantees the widest defense coverage and the earliest possible detection ever feasible. Since no single anti-malware program is perfect 100% of the time against malware, herdProtect’s multi-engines leaves no room for you to worry. Below is pictorial representation of the kind of protection you get on the right with herdProtect’s engines compared to a single one. 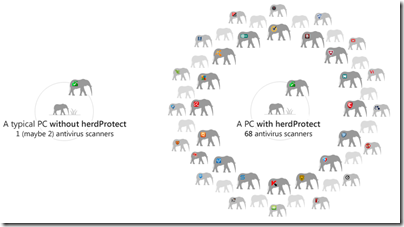 herdProtect Anti-Malware Scanner comes as a Free Windows desktop program available for windows 8/7/Vista/XP (32 and 64 bit). It’s quite fast to scan and is light weight on your system resources. herdProtect takes a snapshot of all the 'active' files on a user’s system. After stripping any personally identifiable details these files are anonymous and securely sent to the herdProtect servers to be analyzed. Post analysis, the reports are sent back to the user and displayed. Therefore, having 68 anti-malware scanners at your disposal will make sure that no known threat goes under your nose undetected. So why wait any further. Head over to the link below and download a copy of scanner get started. PS: As herdProtect is in Beta stage it will not remove any malware, but will identify all malware(s) on your system as well as provide you detailed information. Microsoft Send, an email based messaging platform.